Law Tigers Restricts Employee From Associating With Motorcycle Clubs. Would you believe someone that said, “I support motorcycle clubs and champion the rights of mistreated riders. 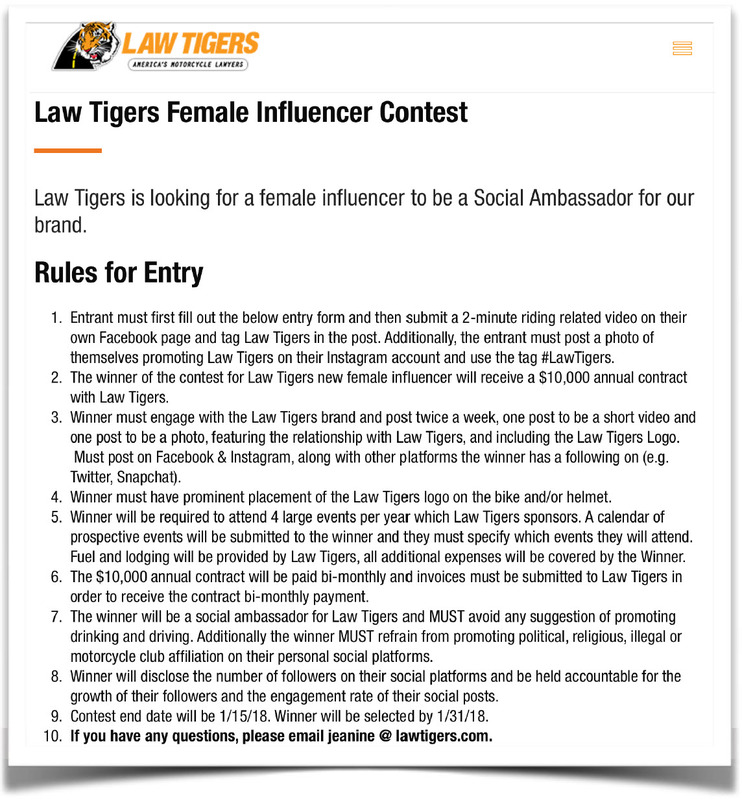 But my female Social Ambassador must refrain from promoting any association with motorcycle clubs or political issues relating to motorcycle rights.” Well that’s exactly what Law Tigers has done. Law Tigers, a national franchise business of injury attorneys who market to motorcyclists, boasts on their website that they exist to help all riders. Beyond accidents, Law Tigers claims to stand for the rights of motorcyclists, including clubs. But in seeming direct contradiction to these statements of support, a requirement of a posted Law Tigers Social Ambassador position requires that the ambassador not promote any political or motorcycle club affiliations, a requirement that would be considered unconstitutional if Law Tigers were a state employer. It’s difficult to square these two perspectives simultaneously. Motorcycle clubs are lucrative marketing ground and also influential among the broader biker community. Supporting attorneys that actually support motorcycle clubs and rights should be an important directive for all club members and rights advocates. The motorcycle rights movement has been primary marketing ground for motorcycle accident attorneys for decades. And the social contract can be mutually beneficial. It’s no secret that personal injury law is one of the most profitable forms of practice. It’s also no secret that motorcycle accidents are common, particularly among motorcycle clubs which represent the segment of the motorcycling community that rides the majority of miles ridden in America. Profits from this relationship can fund critical civil liberty lawsuits to fight discrimination against motorcyclists that would otherwise lack sufficient funding. Lawsuits can be very expensive. The promise to pursue rights based claims can be very persuasive to motorcycle club members. The fact that a portion of profits from an accident settlement/judgement is re- dedicated to fight discrimination provides a mechanism to address issues that would otherwise go unchallenged. But motorcycle club members realize the value of this relationship and are often skeptical that the attorneys obligations under the social contract are being fulfilled. Of course they have to say they support motorcycle rights and motorcycle clubs. But what if this same organization creates employment requirements that would be unconstitutional infringements on association and speech if imposed by a state employer? The Law Tigers website describes the firm’s goals and background in a third person narrative. In the About section, Law Tigers is described as caring for all riders and even going so far as to say that Law Tigers is a champion of motorcycle rights, including clubs. Ok. So Law Tigers talks the talk. But what do they require of those representing their brand? Motorcycle club members are a very valuable resource for motorcycle accident attorneys. Regardless of private entities such as Law Tigers legal right to restrict employees expression rights, motorcycle club members and motorcycle rights advocates have a choice when they are the unfortunate victims of an accident. All motorcycle accident attorneys will tell you they support clubs and rights. All accident attorneys say they are the “champion” of motorcycle rights when a victim is deciding whether to retain them for an accident. But not all all motorcycle attorneys walk the walk. Certainly, motorcycle club members and other motorcyclists concerned about civil liberties should be hesitant to hire an attorney that didn’t want their social ambassador to express association with clubs or political issues. The post Law Tigers Restricts Employee From Associating With Motorcycle Clubs. appeared first on Motorcycle Profiling Project. Source:: Law Tigers Restricts Employee From Associating With Motorcycle Clubs. This entry was posted in Motorcycle Profiling Project on January 19, 2018 by Webmaster. The tragic murder of Outlaw Motorcycle Club member Paul Anderson on December 21, 2017 near Tampa Bay has been used by Pasco Sheriff Chris Nocco to perpetuate fear about motorcycle clubs generally and to desecrate the memory of a decorated military Veteran. The National Council of Clubs, representing motorcyclists around America, issued a press release expressing outrage at Nocco spreading unnecessary fear and dismissing Paul’s murder as an example of bad things happening to bad people. Some local news media outlets payed attention and reported this outrage in response to further fear tactics being used. Nocco started to express concern over Paul’s funeral service on January 6th, and the local NBC affiliate balanced these warnings with the NCOC press release issued on January 5th. Based on reports of an MPP contributor on site, Nocco and law enforcement did not act on threats to harass bikers for traffic infractions during the January 6th memorial service. Instead, they served their proper function and even blocked traffic for the procession. The local NBC1and ABC2 affiliates reported on January 5th that Nocco claims that hundreds and even thousands of outlaw motorcyclists from around the country were descending on Florida, and that law enforcement would profile club members for any little mistake in order to keep everyone in line at Paul’s funeral. “There is going to be overwhelming law enforcement presence. We are going to make sure there is peace. We are going to make sure everybody abides the traffic laws. There is not going to be blocking traffic, if people are running a red light, they are getting a ticket,” Nocco said. A visible law enforcement presence to deter another violent incident is specific and justifiable. Paul was shot and killed while sitting in his vehicle, in broad daylight, on a public road. Three members of another motorcycle club were arrested for the murder within hours. But to go beyond a deterant function with specific threats of selective enforcement targeting club members that have committed no crimes is simply deplorable. “The murder of Paul Anderson is a tragedy. Paul was an innocent and valuable human being and his memory does not deserve to be desecrated,” the National Council of Clubs said in a statement. But after the NCOC Press Release was reported in the local news media, Nocco adjusted his explanation and claimed that LE’s function would be confined to deference through visible presence. Nocco responds he just doesn’t “want trouble before or after the funeral.” Based on reports by attendee and MPP contributor Bobby Colella, law enforcement performed their function of deference through presence without incidents of harassment or profiling. On 6 January, 2018 at around 1pm, on a sunny Sunday afternoon in New Port Richey, Florida, I was one of hundreds of motorcycle club members who pulled out from the Cross Bayou Chapter of the Outlaws M.C. clubhouse as part of the funeral procession for Paul Anderson. In the lead were the police, with sirens blaring, then the bike with the hearse in tow, then a small pack of bikes, then a limousine with family members that was followed by the Outlaws M.C., who was then followed by various other clubs and riders who came to pay their respects. Two- by-two we rolled down the dirt road, over the bridge and onto the main highway. As we pulled onto the main strip, we passed multiple police vehicles to include military tactical vehicles consisting of a HMMWV and a blacked out 5-ton (M939) cargo style vehicle. They were parked across traffic lanes as mobile barriers. As the procession proceeded along the route, one couldn’t help notice the multitude of parked police vehicles and the squads of officers from local, state, and federal agencies that were strategically positioned along the entire route to Dobies’ Funeral Home. 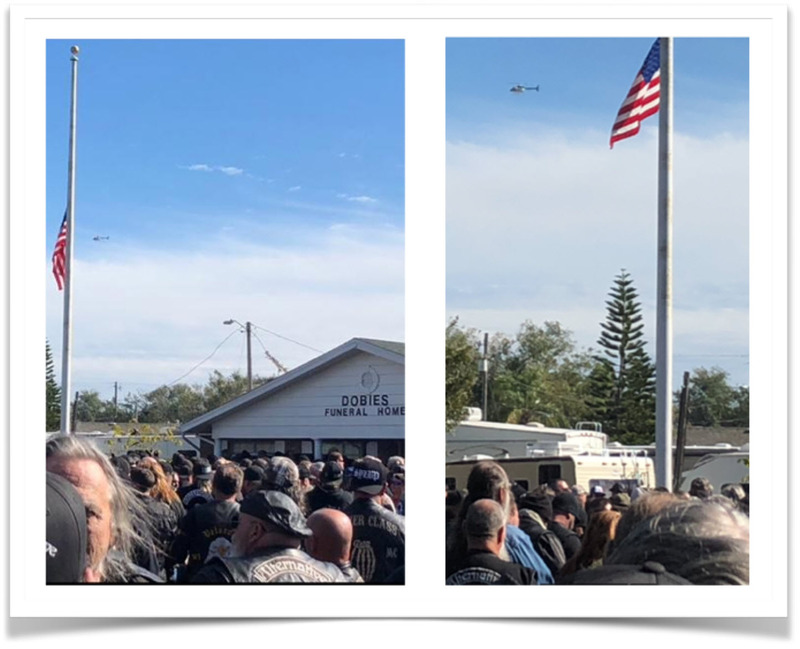 Beyond the initial observation of the heavy law enforcement presence and the constant sound of a Pasco County sheriff’s helicopter overhead, was another presence, the presence of the American citizen. You could not help but notice the hundreds of people that lined the road. Some we curious onlookers, some were people who were stuck in the traffic, but many were there very deliberately. They had their hats in hand, hands over their hearts standing at attention, and paying their respects to an American war veteran who lost his life in a senseless and tragic murder. The paradox of an overwhelming police presence, tactical vehicles, helicopters and volatile press-briefings designed to not only criminalize an individual, but also criminalize an entire subset of the American population; overlaid with 100’s, if not a thousand Americans gathering from all corners of the country on a cold January afternoon to pay their final respects doesn’t make sense. There is no doubt that if left ONLY with Nocco’s version of who Paul Anderson was, these people lining the roads wouldn’t have known the true person this procession was for. Law enforcement as a whole did a good and safe job of blocking traffic and not harassing the participants. Though, they probably could have saved the taxpayers some money if they left the helicopter on the helipad! The post Police Respectful at Outlaws Funeral After Media Reports Public Outrage appeared first on Motorcycle Profiling Project. This entry was posted in Motorcycle Profiling Project on January 9, 2018 by Webmaster. All FL Bikers at Risk After LE Statements Regarding Murdered Outlaw. Re: LE statements following Outlaws MC Paul Anderson killing. 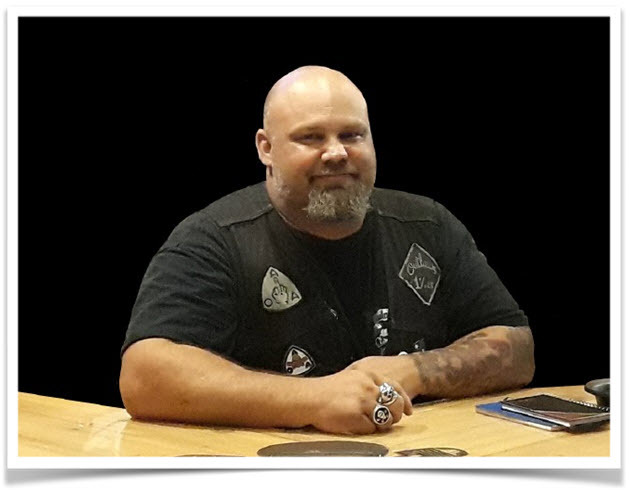 The National Council of Clubs, an organization dedicated to protecting the political, legal and legislative interests of motorcyclists nationwide, is very concerned that law enforcement is using the tragic murder of Outlaw Motorcycle Club member Paul Anderson near Tampa Bay on December 21st to dangerously propagate unnecessary fear and bias against all motorcycle clubs and bikers. Law enforcement is using the local news media to imply that Paul was a deserving criminal and to report that outlaw motorcycle clubs nationwide are headed to Florida for retaliation. 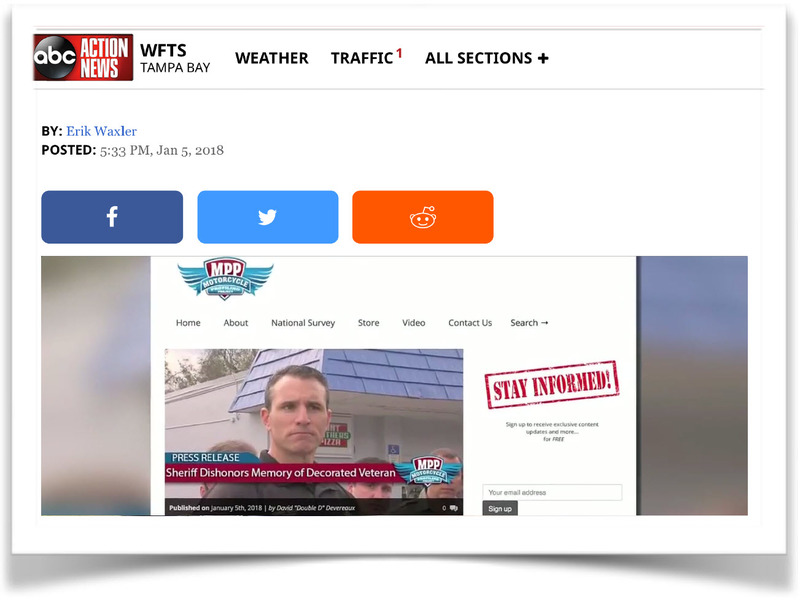 More than being highly inaccurate sensationalism, such fear-driven propaganda creates very real risks to the civil liberties and safety of innocent motorcyclists in Florida. After three suspects were arrested within 24 hours of Paul’s murder, Pasco County Sheriff Chris Nocco conducted a press conference covered in the local news media. (See Video Here) Nocco was completely dismissive of Paul as a person because he was a member of the Outlaws MC. The fact that he was an innocent victim was never reported. Instead, Nocco, when discussing Paul, said “bad things happen to bad people.” There was not a single mention of his decorated military service or of his surviving family. The truth about Paul would not fit Nocco’s false narrative of fear. The murder of Paul Anderson is a travesty. He was an innocent and valuable human being and his memory does not deserve to be desecrated. The truth is that he was a hero and a loved son and brother. According to his Certificate of Release or Discharge from Active Duty, Paul had a distinguished military career and served in the U.S. Army as a Sergeant who was both Army Ranger and Sniper qualified. His decorations and awards include the Purple Heart, Combat Infantryman’s Badge, Expert Infantryman’s Badge, Master Parachutist’s Badge, Army Commendation Medal, Army Achievement Medal (2nd award), Overseas Service Ribbon, and the Good Conduct Medal (2nd award) to name a few. Paul was Honorably discharged after 6 years of service to our country and pursued a professional contracting career. Paul is survived by his mother, his sister, and many club brothers. He wasn’t married and had no children. Paul will be laid to rest next to his brother who was previously killed while also serving in the armed forces. The truth is that Paul Anderson was a hero and a loved son and brother. Instead of the truth, Nocco chose to use this tragedy to spread fear among the general public and other law enforcement agencies. Nocco says that motorcycle clubs are no different than the Italian mafia, that there are tens of thousands of members. He falsely claims that motorcycle club members are coming into Florida from across America to retaliate. Further, Nocco urged the public to call police to report any sightings of motorcyclists with out of state tags or motorcyclists riding in a pack with club colors on. He leaves no possibility that most motorcycle club members do not engage in criminal activity. “Don’t be disillusioned,” he said. “There are professionals in these groups, lawyers, in public safety unfortunately. They have 9-to-5 jobs in hospitals and are nurses.” However, Nocco said when they’re not being a nurse, when they’re out here, they are committing crimes. Nocco urged the public to call police to report any sightings of motorcyclists with out of state tags or motorcyclists riding in a pack with club colors on. These assertions are absurd. To suggest that motorcycle club members are professionals by day and criminals by night is self-serving nonsense. Nocco, and others embracing his worldview, simply cannot fathom that the majority of motorcycle club members, including those in 1% clubs, are working professionals with no criminal records that regularly participate in 1st Amendment protected activities. Do some motorcycle club members commit crimes? Of course. Just as some cops commit crimes. But illegal acts committed by individual cops do not mean all cops are criminals any more than this incident means all 1% club members are criminals. It is a fallacy of composition to make a generalized presupposition about a community consisting of thousands of people based on the actions of the few. The NCOC is outraged that authorities are using this tragedy to tarnish Paul’s memory and perpetuate fear that could impact innocent motorcyclists. Thousands of bikers and motorcycle club members travel to Florida annually for dozens of events that happen around the state, including the Tampa Bay Area. Of immediate concern is the fact that many out of state club members will be coming to Florida in January for Paul’s memorial service. Club members will be coming to show their respects, not to retaliate. They are now all at risk of being profiled, harassed, or worse. This is not the first time law enforcement has used a tragedy to perpetuate dangerous rumors. Following the Waco tragedy on May 17, 2015, Sargent Swanton of the Waco PD issued similar warnings. Swanton too reported that motorcycle clubs were descending on Waco to retaliate. However, in the end, after many months, law enforcement admitted all of the retaliation claims were false. The motorcycle club community knew these rumors were false when they were reported in Waco, just as the NCOC knows Nocco’s warnings are false now. It is irresponsible and unethical to use the spotlight created by tragedy to criminalize an innocent victim and perpetuate fear of an entire community of associations protected by the 1st Amendment. The post All FL Bikers at Risk After LE Statements Regarding Murdered Outlaw. appeared first on Motorcycle Profiling Project. Source:: All FL Bikers at Risk After LE Statements Regarding Murdered Outlaw. This entry was posted in Motorcycle Profiling Project on January 5, 2018 by Webmaster.